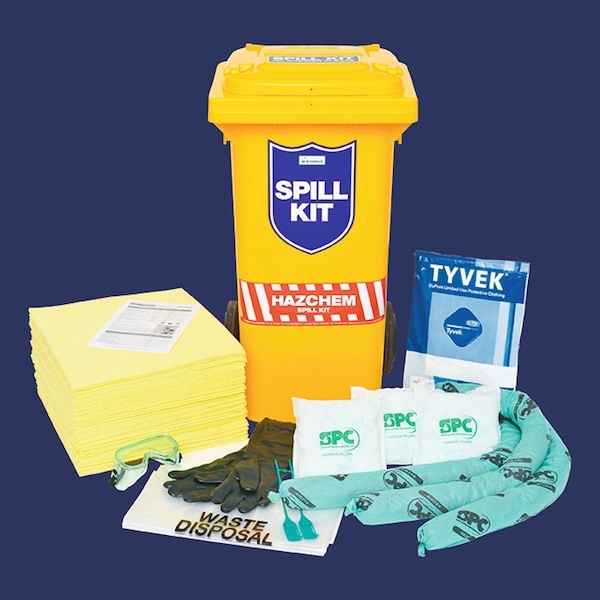 The HazChem Spill Kit is designed specifically for aggressive chemical spills of strong acids, oxidisers, or alkali and caustic liquids. Ideal for workshops, warehouses, fleet maintenance shops, food manufacturers, pool operations, chemical manufacturers, wineries and other ‘high risk’ areas, where corrosive liquids such as battery acid, pool acid, caustic soda, alkali cleaners and other common acidic and alkaline liquids are handled. For use by any business that has identified risks due to spilt acidic or alkali liquids, and ideal in environments where wet cell batteries are recharged or where caustic cleaning solutions are used. Highly absorbent — each kit absorbs up to up to 75 litres of acid or alkali liquids. Comprehensive solution — contains synthetic pads and socks, PPE and clean-up accessories for both acid and alkali spills.